Out of all the characters in Shakespeare's Macbeth, Lady Macbeth has to be the most memorable and intriguing one, perhaps even more so than Macbeth himself. With her "Out, damned spot! out I say!" she's a formidable foe who eventually crumbles under the guilt that gnaws away at her, leading to a tragic end. Remembering my perception of her from long ago, I went into reading Lady Macbeth: Daughter of Ravens wondering if I'd end up changing my mind. 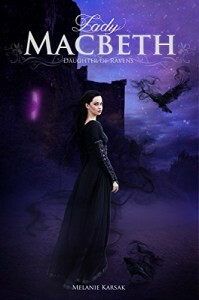 From the synopsis, Gruoch will become Lady Macbeth, yet I already feel for her. The way her uncle, who's also her adopted father, leers at her and violates her sense of safety is appalling. With him around there is no peace and certainly no happiness. Just from these encounters I knew I wasn't going to view her the same way. Karsak paints a different and comprehensive picture of this character and how she came to be in a position of power. I love the idea of taking a famous figure from literature and reimagining an entirely different life for that figure. I also love how Karsak weaves some of the most famous lines into her story, the best one to me being, "What's fair is foul and foul is fair." The pacing was slow for me, and I became restless at times while reading. I also had trouble piecing together everything that was happening even though I know reincarnation plays a huge part. With that being said, I'm way too intrigued by Karsak's rendition of Lady Macbeth and will continue reading the series. I have a feeling Karsak is just getting warmed up.